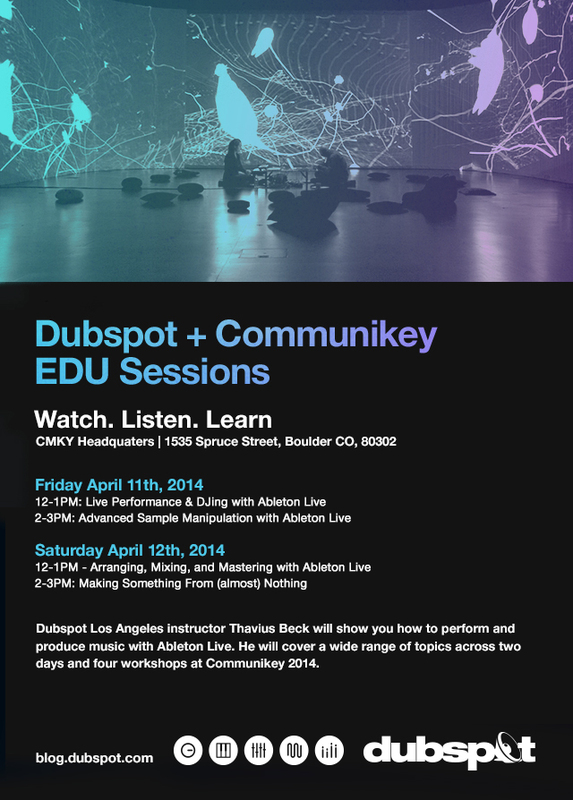 The Dubspot EDU Sessions will be coming to Communikey in Boulder, CO on April 11th and 12th, where Dubspot instructor and music producer Thavius Beck will host a series of four workshops on Ableton Live. This year marks the 7th edition of Boulder, Colorado’s annual Communikey Festival, a four-day music and arts festival. Dubspot is proud to present four Ableton Live workshops in partnership with the Communikey Festival on Friday, April 11th and Saturday April 12th. Dubspot Ableton Live Certified Instructor Thavius Beck will host these workshops which will cover aspects of the popular DAW including live performance, track composition and mixing and mastering. Check out the full schedule below along with more information on each workshop. Thavius Beck has used Live exclusively over the last 5 or 6 years for his own solo performances around the world. In this workshop, he will give you an extensive look at his personal show setup, and discuss various scenarios for setting up a live performance and/or DJ set with Ableton Live. In this workshop, Ableton Certified Dubspot Instructor Thavius Beck will discuss multiple ways that we can approach sample manipulation using the tools available in Ableton Live. Topics will include advanced warping techniques, time stretching with Sampler and Simpler, unorthodox resampling techniques, and much more. With Ableton Live, it can be easy to spend the majority of your time in the Session View playing with loops, but at a certain point you’ll want to take all of those loops and ideas and arrange them in a way that takes the listener on a journey and tells whatever story you want to convey. One thing that a lot of up and coming producers aren’t aware of is that there are some basic formulas used when it comes to arranging that can help make your songs more palatable and sound more professional. There are also some fundamental principals when it comes to mixing that can greatly enhance the overall clarity and width of your mixes without needing to use external effects or devices. We will explore all of this, and finish off discussing various ways to master your finished mixes in Live. In this freeform workshop, Thavius Beck will demonstrate how easy it is to build the foundation of a song using only one sound in a multitude of ways… We will start by recording a sound from a nearby source, and in the course of manipulating it in numerous ways we will discover many of Thavius’ own personal techniques and workflow regarding resampling, routing audio, building effect chains, MIDI programming, and sound manipulation.